Since 1981, we have been the benchmark for standardized tests for measuring the competency of hearing healthcare professionals. 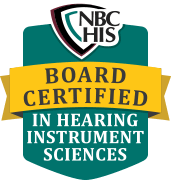 Ours is the only board certification program for hearing aid specialists in the hearing healthcare profession accredited by the National Commission for Certifying Agencies (NCCA). Like every other field, hearing technology is a rapidly changing specialty, and as it continues to evolve there is a constant need to champion a standard of excellence. NBC-HIS sets and upholds those standards through innovative thinking and a commitment to excellence for the benefit of the hearing impaired consumer. When you choose a Board Certified Hearing Healthcare Professional, you can rest assured that you're getting the best in the business and the peace of mind that goes along with it. Good hearing has a direct impact on your quality of life. For many, hearing loss is so gradual that it is hardly noticed. Hearing loss is usually detected first by family, or as a result of a hearing test. There are many other clues to possible hearing loss, but these are the most frequent indicators. Selecting the best qualified hearing healthcare professional is a decision that will have an enormous impact on your quality of life. It is important to find a Board Certified professional - one who has a proven commitment to professional excellence. A Board Certified professional has spent a great deal of time and effort preparing for and completing the certification process. This dedication to professional growth is the mark of an accomplished hearing healthcare professional who continuously strives for advanced levels of quality care. · Receiver in the canal hearing aids (RIC) a small behind the ear style device with the receiver inserted into the canal. · Completely-In-The-Canal (CIC) fits deep in the canal and is barely noticeable. · In-The-Canal (ITC) fits within the canal portion of the ear and is less visible. · Behind-The-Ear (BTE) model is a small hearing instrument housed in a curved case that fits securely behind the ear. It is attached to the earmold by a short, plastic tube. Sound is delivered from the hearing instrument through the earmold and into the ear canal. BTE models will fit the widest range of hearing losses. · In-The-Ear (ITE) model fits within the outer ear, extending into the ear canal. This model accommodates wider varieties of hearing losses. No locations were found within your search parameter!